CloudFone Announced "Give 20 Get 50 Promo", Get 50% Off On Spotify Devices! 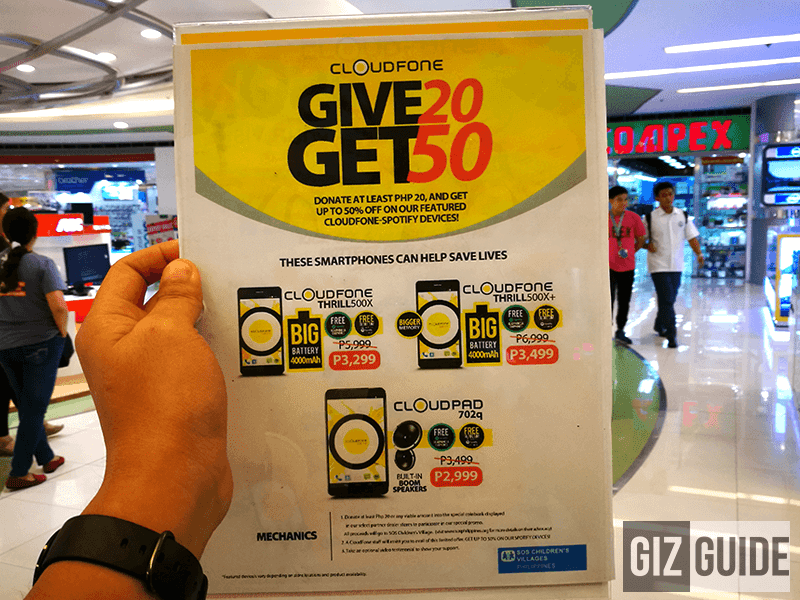 Home / cloudfone / mobile / news / CloudFone Announced "Give 20 Get 50 Promo", Get 50% Off On Spotify Devices! While strolling around SM Cyberzone, we spotted CloudFone's latest exciting promo. Dubbed as the "Give 20 Get 50" promo, anyone who'll donate at lest 20 Pesos will get 50% off the following mobile devices: CloudFone Thrill 500x, Thrill 500x+, and Thrill 702q tablet. Related: CloudFone Thrill 500x And 500x+ Unboxing And Impressions - Your All Day Spotify Buddy! To refresh our minds, the CloudFone's Thrill 500x is a 5 inch handset with octa core processor, and large 4,000 mAh of battery capacity. From the old SRP of 5,999, it'll be down to 3,299 Pesos. As its name suggest Thrill 500x+ is the upgrade of Thrill 500X. It still uses the same 1.7 GHz octa core chip and 4,000 mAh battery, but it has bigger 2 GB RAM and 16 GB of internal storage. From 6,999, its down to just 3,499 Pesos. Related: CloudPad 702q Spotify Edition Review! Complete Multimedia Package On A Budget! On the other hand, the CloudPad 702q is a 7 inch tablet that features a nice type of flip cover that also serves as a stand. It also has a dedicated boom speaker at the back to let you enjoy music louder. From its old SRP of 3,499, you can now grab it for 2,999 Pesos during this promo. All the above-mentioned devices will also come with a FREE Spotify edition headphones, earphones, and Globe SIM. The proceeds that will be collected during this promo will be donated to SOS Children's Village. You may also take an optional video testimonial to show your support to this helpful initiatives that can save lives.